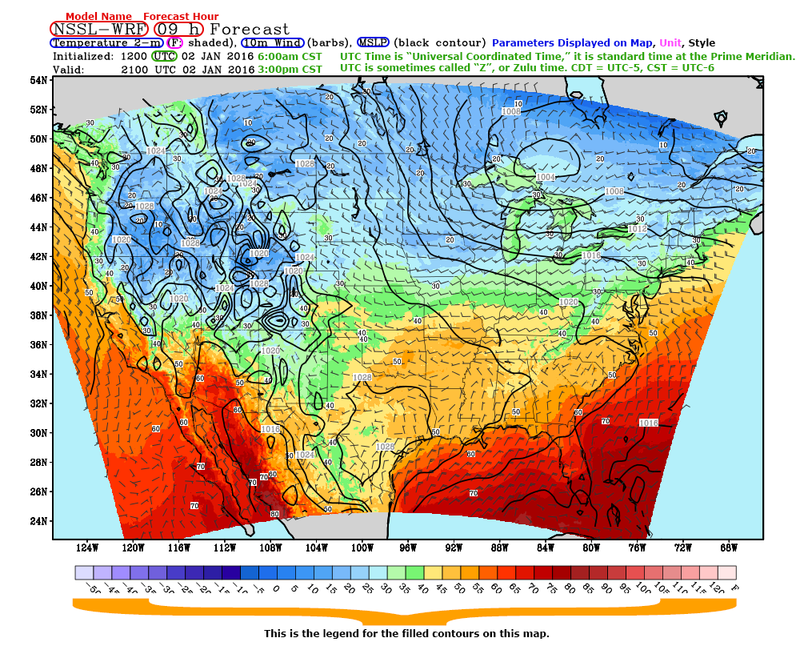 Click to explore the NSSL-WRF website. Can you tell what part of the world is displayed here? It’s the CONUS—CONtinental US. The color-filled contours on this map might look familiar. They plot temperature in °F. Local newspapers and TV stations use maps just like this one for their publications and broadcasts. What about the other parameters? This graphic doesn’t tell us what units they are! Worse yet, what are “barbs! ?” What is MSLP? Basehunters Chasing knows. That’s why we see ALL the tornadoes! Check out this graphic from UCAR to discover for yourself: (don’t get bogged down by talk about vectors and %’s). So “barbs” are just a way of displaying information about wind speed and direction, and by convention they use the unit Knots. They’re all over this image if you look closely. 10 meters is the standard height above ground level at which anemometers and wind vanes at weather stations record wind speed and direction data. Finally, “MSLP” stands for “Mean Sea Level Pressure,” it’s how meteorologists display barometric pressure at the ground. This shows you high and low pressure areas. The contours on the map are isobars, or lines of equal pressure. If you would like to learn about reading contour maps, head over to our page about reading contour maps. Try the short quiz below to gain practical experience reading computer models. The questions are based on the NSSL-WRF map at the top of this page, you may want to open it in a new tab for easy access through the quiz. What is the temperature in Oklahoma City? (Oklahoma City is in the middle of the state of Oklahoma). What is the wind direction at Oklahoma City (where is the wind coming from)? What is the MSLP at Oklahoma City? Austin, TX resides inside a closed pressure contour. Is Austin near a center of high pressure or low pressure? True or false: "There is a low centered northeast of Lake Superior, and its central pressure is less than 1004mb." Now that you’re done with the quiz, find the weather conditions at your hometown. With practice, you’ll be reading model maps very quickly. If you want to find links to other models, check out our weather links page!